This section is organized by Parking System Type. Click the appropriate link below to view the FAQ’s for the desired system type. Click the following link to download a word file of these questions and answers. What is a Mechanical Parking System? Mechanical parking systems utilize electrical and hydraulic equipment to raise a platform (containing a vehicle) to a height above the grade surface area, thereby allowing another vehicle to park beneath it. A mechanical parking system uses simple electrical controls to operate the platform. Operators or trained patrons may operate the controls. What can the driver/operator expect? A patron or operator of a mechanical parking system positions the vehicle on the parking tray, manually aligning their vehicle onto the designated area. The vehicle is then exited and the manual control is activated to raise the vehicle..
What benefits are there to using a Mechanical System? Fit twice the cars in the same space utilized for conventional parking or use half the space for the same number of cars. Other benefits can be realized by less excavation for below grade garages or more leasable/sellable square footage for above ground garages. How long does it take to retrieve a car? Most Mechanical Parking Systems will lower a vehicle within 20 seconds. However depending on type of system, technology and configuration this number could vary when several people arrive at the same time requesting vehicles from the same area of the garage. How reliable is a Mechanical Parking System? Owed to their relatively simplistic equipment design, most Mechanical Parking Systems provide trouble free operation with a little preventive maintenance care. What happens during an electrical failure? Vehicle is stuck in place until power is restored, unless a backup generator has been installed. How many parking spaces can be built with a Mechanical Parking System? Due to the modular flexibility of the Mechanical Parking Systems, as many systems may be connected as physically allowed at the site. What type of cars can a Mechanical System accommodate? Most Mechanical Parking systems are designed to accommodate standard vehicles including most SUV’s having a max length of 19’ (5791mm) and width of 7’6” (2286mm) with heights and weights that very from system to system. Also most companies can accommodate any size vehicles with modifications. What is the average operational life of equipment before major repairs or replacement of the key elements in the system are required? Depending on the type of system, overhaul should be carried out after 12-15 years of operation. Basically, lifetime of a Mechanical Parking System is comparable to the lifetime of the building. Can I be sure that nothing will get (drip) on my car (oil, water, etc.) from the vehicle above me? In a pallet based system every car is placed on specially designed pallet, which excludes the possibility of any liquid dripping on the car, located on the level below. 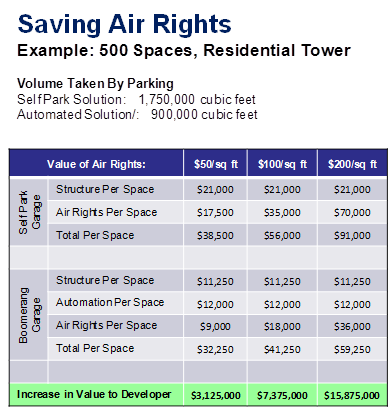 What is the cost per space for a Mechanical Parking System? The required throughput of the system. These three variables are of equal importance in the equation for project estimate calculations and can result in prices ranging from $3,000 USD per space to over $10,000 USD per space. What does it cost to operate a Robotic Garage? This of course varies depending on the type of garage. With the elimination of parking attendants, heating, cooling, ventilation and lighting requirements for public access. The cost to operate a Robotic Garage is drastically reduced in most situations. The following is a good rule of thumb for the ongoing operation of Robotic Garages. How many employees are needed to maintain a Robotic Parking System? Considering that Robotic Parking systems are fully automated the presence of permanent staff is not required, but in some cases (given the novelty of the product), the presence of one or two technicians on the premises is suggested upon opening for a short period of time. Most manufactures offer a maintenance program which includes onsite preventative maintenance and 24×7 remote monitoring of the facility. What is the monthly per space cost for ongoing maintenance? This price varies from manufacture to manufacture. The numbers below represent a good range promoted by most manufactures. 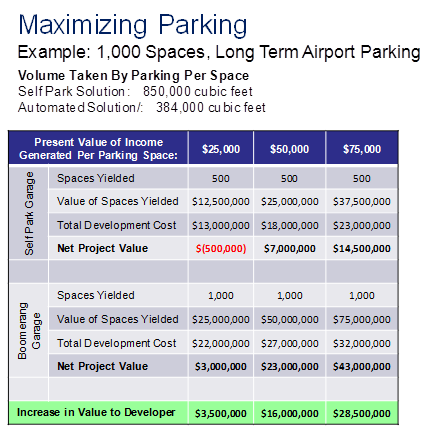 What additional rooms are needed to operate a Robotic Parking System? Most Robotic Systems would require in addition to the actual storage volume, a Control Room, Lobby/Waiting Room, Electrical Room, Pump Room, Generator Room and Storage/Maintenance Room for spare parts are needed. The size of these rooms will change based on manufacture. Does the Robotic Parking System require a stand-alone building or can it be built under or inside a building? Most Robotic Parking System can be stand-alone, below a building or above a building as long as there is clear access and staging to the drop-off and pickup bays. The Robotic Valet can be retrofit into existing buildings, using existing floors. Are Robotic Parking Systems supporting structures made of steel or concrete? Most Robotic Parking System technology can be used in both a steel or concrete structure. Does the façade and roof need be self supporting or can they be connected to the Robotic Parking System structure? For most Legacy Rack & Rail systems the façade and roof can be attached to the Robotic Parking System supporting structure and do not need be free standing. This is not an issue with Robotic Systems that use concrete structures. Which temperature ensures stable operation of a Robotic Parking Garage? Most Robotic Parking garages recommend temperatures ranging from -22 F (-30 º C) to 122 F (+50 º C). Is a Robotic Parking System suitable for handicapped persons? As long as the drop-off/pickup bays are compatible with the requirements of the ADA – American Disability Act. Then all spaces within the garage are ADA compliant. How secure is the Robotic Parking System? Safety and security are unsurpassed compared to any other parking scheme. Consider that parking lots are the number one place where sexual assaults by strangers occur. Unfortunately self park garages are difficult to monitor and secure and therefore present an opportunity to would be robbers and assailants. Even if no one is lurking in the garage, it can be an unpleasant experience to walk alone at night to one’s car in a large ramp garage. By contrast consumers do not enter automated parking garages and occupied space is limited to a small central common area which is easy to monitor and secure. What are the fire requirements for Robotic Parking Systems? In North America one of the biggest obstacles with Legacy Rack & Rail systems is fire access. This one item has limited the growth of Robotic Parking Systems in North America over the last decade. New technology and methods have addressed this issue in recent years. In the coming months I will post a detailed report on fire requirements for Robotic Parking. What is the level noise from automated parking system? Based on the existing building codes the maximum noise levels shall not exceed 60 dB at a distance of 6’ (2 meters) away from the building. The noise level of the mechanisms used in most Robotic Parking Systems do not exceed 50-52 dB at a distance of 6’ (2 meters) inside the parking facility, so the system is virtually noiseless. Does a Robotic Parking Garage need to be illuminated? No, there is no need for full lighting the garage. Most Robotic Systems are considered dark garages, since there is no human presence inside the facility. However minimum emergency and maintenance lighting will be required by local code. What light level is required in the parking area? What is the required light level for drop-off/pickup bays? For Loading Areas it is recommends 30 foot candles of lighting to operate full D1 video at 30fps, though possibly less lighting might be required at kiosk locations. The most recent NFPA 88A-A2010 specifies that “9.2.3.1 an enclosed automated type parking structure shall be provided with a ventilation system that continuously provides a minimum of two air changes per hour.” (Conventional is 7 air changes per hour. How is a driver alerted when they are not correctly centered (within tolerance) within the drop-off bay, and what kind of communication is provided to help guide them into an acceptable position? Most Robotic System provide an LED display positioned at the far end of the drop-off bay from the entry door, it will offer illuminated text and symbol directions to the driver that change in response to the vehicle’s positioning as the driver pulls in. This will occur the entire time the vehicle is being driven into the Loading Area. Once the vehicle is positioned correctly within tolerances to be stored, the display will direct the driver to stop. Assuming the driver stops within tolerances, the sign will then provide other helpful directions to facilitate the vehicle storage. Are there any limitations to what kind of vehicle can be parked within a Robotic Garage? Automated parking garages rely on technology similar to what is used in manufacturing and warehouse facilities world wide for cost effective movement of materials, pallets, etc. The Automated Garage uses computer-controlled vertical lifts and horizontal shuttles to transport vehicles from an arrival area to a remote compartment for storage without human assistance. What can the Patron (driver) expect? A patron’s experience of an automated parking structure begins as the patron drives into an enclosed entry drop-off bay and parks, aligning their vehicle with the help of sensors and lasers. The patron gathers their belongings and exits the vehicle. The patron takes a ticket from a kiosk machine outside the compartment, triggering the compartment door to close. When exiting, the patron goes to a centralized location (waiting room) puts the ticket into a kiosk and the system retrieves the vehicle. An interface informs the patron which exit compartment the vehicle will be returned to. The patron loads belongings and drives out forward. Many green aspects are inherent to Automated Garages such as, additional open space for parks, etc., elimination of carbon emissions, no water/oil runoff, etc. In addition to the smaller building size and increased parking capacity, Automated Parking Systems virtually eliminates vandalism, theft, weather damage, misplaced vehicles and provide a valet type experience when parking your vehicle. Most Automated Parking Systems tout retrieval times of 90-120 seconds. I will be more than happy to provide a throughput analysis on a case by case basis. How reliable is a Robotic Parking System? Robotic Parking Systems provides true redundancy with multiple elements controlling the same process to provide alternatives in case of a component failure. Most Robotic Parking Systems are equipped with a stand-by generator in sufficient capacity to get the job done if or when there is a power failure. An automatic transfer switch ensures a seamless transition to stand-by power within 6 seconds. Most Robotic Parking Systems servers are not only equipped with UPS (Uninterruptable Power Supply), but also with a true hot swappable redundant server that has all information instantly available to continue seamless operation. Can a car ever get stuck inside the Robotic Parking System? Robotic Parking Systems are designed from the very beginning with exactly this in mind, how to overcome any possible machine failure so the car can be retrieved no matter what the situation. Different systems take longer than others to rectify the situation. This design point is represented in the system architecture, its redundancies and flexibilities. How many parking spaces can be built with a Robotic Parking System? Due to the modular flexibility of the Robotic Parking Systems, automated parking structures are designed and built for a few to thousands of parking spaces. The Robotic Valet technology has no limit on the amount of cars that can be parked within the conventional structure. What type of cars can a Robotic System accommodate? Most Robotic Parking systems are designed to accommodate standard vehicles including most SUV’s having a max length of 19’ (5791mm) and width of 7’6” (2286mm) with heights and weights that very from system to system. Also most companies can accommodate any size vehicles with modifications. Depending on the type of system, overhaul should be carried out after 12-15 years of operation. Basically, lifetime of a Robotic Parking System is comparable to the lifetime of the building. Boomerang the manufacture of the Robotic Valet suggest an overhaul of its Robotic Valet’s every 15-20 years. Most pallet-less systems usually use solid concrete floors eliminating this occurrence. 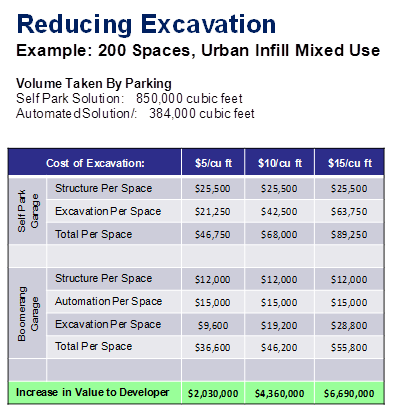 What is the cost per space for a Robotic Parking System? These three variables are of equal importance in the equation for project estimate calculations and can result in prices ranging from $9,000 USD per space to over $30,000 USD per space. Much more important than just comparing construction costs are the overall DEVELOPMENT costs. The illustrations below give you a good idea of how Robotic Parking can impact any development. What is Automated Robotic Parking? Robotic parking garages rely on technology similar to what is used in manufacturing and warehouse facilities world wide for cost effective movement of materials, pallets, etc. The Robotic Garage uses computer-controlled vertical lifts and horizontal shuttles or robotic valets (AGV’s) to transport vehicles from an arrival area to a remote compartment for storage without human assistance. What benefits are there to using a Robotic Garage? Many green aspects are inherent to Robotic Garages such as, additional open space for parks, etc., elimination of carbon emissions, no water/oil runoff, etc. In addition to the smaller building size and increased parking capacity, Robotic Parking Systems virtually eliminates vandalism, theft, weather damage, misplaced vehicles and provide a valet type experience when parking your vehicle. Most Robotic Parking Systems tout retrieval times of 90-120 seconds.